The New Jersey Waterfowl Stamp Program has been a success story for waterfowl and their habitat. Since its inception in 1984, the stamp program has raised nearly $3 million leading to the purchase of over 16,000 acres across the state from Sussex to Cape May (Figure 1). 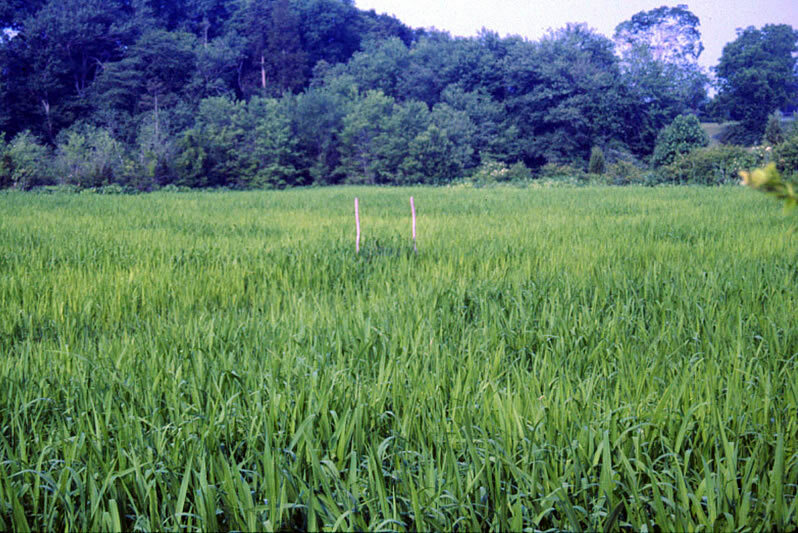 Nearly all of the properties acquired by the program are open to hunting. Since many of the state's most valuable wetlands occur in the southern counties, most of the acquisitions are in that region. (Figure 2). The stamp program has also funded habitat improvement projects and research activities related to habitat carrying capacity research studies in New Jersey. 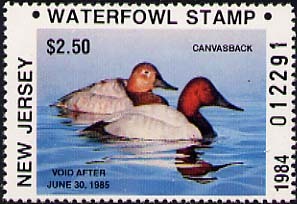 The state waterfowl stamp program was launched in 1984 with this pair of canvasbacks. Stamps and prints with original artwork were discontinued in 2009. All waterfowl hunters 16 years and older are required to purchase a New Jersey waterfowl stamp, available at license agents and online, in addition to the federal Duck Stamp, to hunt in the state. The Waterfowl Stamp Act of 1984 (pdf, 270kb) requires that the monies from the New Jersey stamps be earmarked for the "...acquisition,...improvement, and enhancement of waterfowl habitat and wetlands…and access for public use of waterfowl habitat areas." Stamp Account revenues cannot be used by the general state treasury or for administrative costs within the Division of Fish and Wildlife. 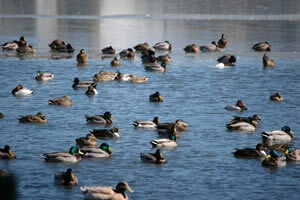 Waterfowl use properties purchased with stamp funds through various stages of their life cycle. From 2003 to 2008 both stamps and prints were produced by renowned artists for sale. Unfortunately, the artwork for the state waterfowl stamp and the paper stamp itself have been discontinued since 2009 but the dedicated funding for waterfowl habitat lives on through a stamp certification. These and other original stamp artwork are on display at the Pequest Trout Hatchery and Natural Resource Education Center. The artwork was discontinued as a cost saving measure since the considerable expense of producing the artwork and stamps resulted in fewer funds being available for the purchase of waterfowl habitat. This situation is not unique to New Jersey as over half of the states which offer state duck stamps have discontinued their artwork for similar reasons. The Waterfowl Stamp Advisory Committee (WSAC) oversees the program. Representatives from Ducks Unlimited, NJ Waterfowlers Association, N.J. Audubon Society, NJ Federation of Sportsmen's Clubs, The Nature Conservancy, Natural Areas Council, Fish and Game Council (2 members), and a Public at Large member serve on the WSAC. DEP's Green Acres Program forwards potential acquisitions (offers) from willing sellers to the WSAC. A biologist from the Division of Fish and Wildlife reviews and rates each of the offers before presenting the decision to purchase to the WSAC. The following criteria are considered in the ranking process: value to waterfowl, value to other wildlife including endangered species, land cost relative to fair market value, public access, proximity to other public land, and other factors. Ultimately, the WSAC makes the decision to purchase the property or decline the offer. 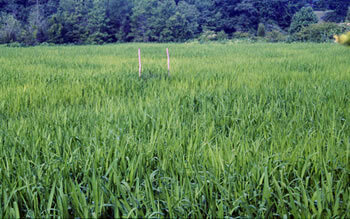 Stamp monies purchase valuable wetland habitats such as this tidal freshwater wild rice marsh. 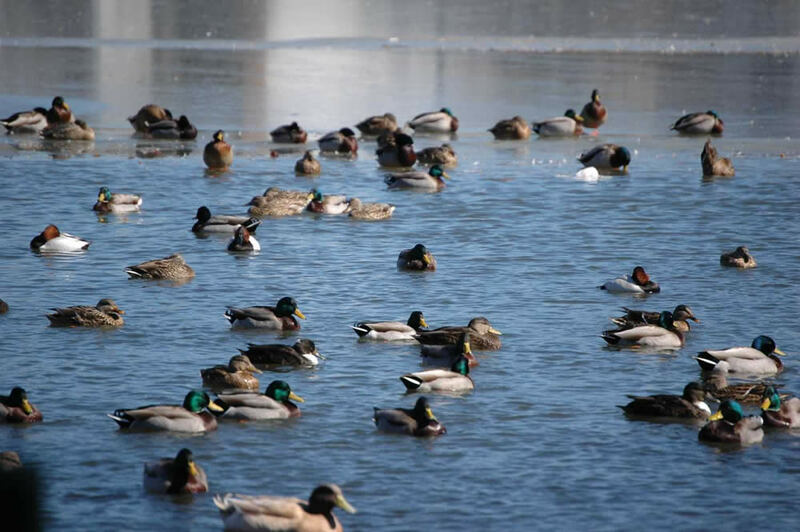 A large number of waterfowl which winter in New Jersey, particularly American black ducks, green-winged teal, Atlantic brant, and Canada geese, breed in Canada. Over the years, the WSAC has worked with Ducks Unlimited and Canadian partners to secure and enhance breeding and staging habitat in Canada through the North American Wetlands Conservation Act (NAWCA). Through this innovative program, each dollar sent to Canada by the WSAC is matched with 4 dollars by other program conservation partners to total 5 dollars for on the ground projects. In particular, monies sent to Canada by the WSAC are spent entirely within Quebec, where most birds that winter in New Jersey originate from. As of 2016, 38 of 50 states contribute funds to this important program.